Replacement Coils for the TFV8 baby tank. Some jet engine coils to power your beastly TFV8 baby tank. Not only will these coils will bring you deep and rich flavour like no other, but they also produce incredible amounts of vapour. So prepare yourself! 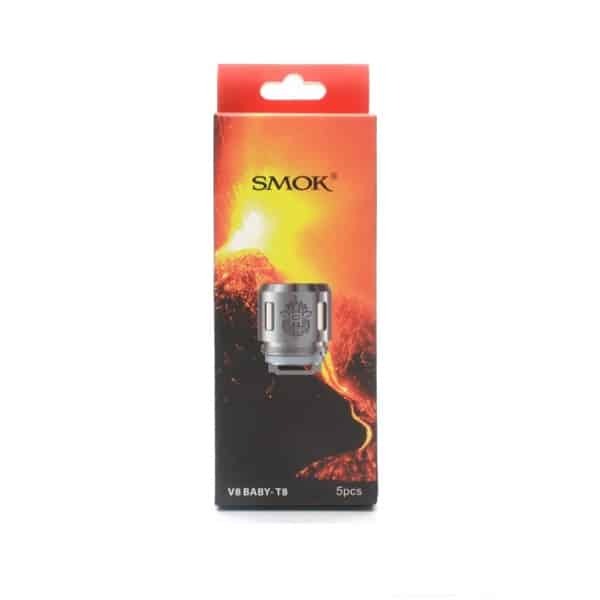 Extend the life of your Smok clearomizer by simply just replacing only the coil! It’s easy to do, just unscrew the top cap, then the tube, then unscrew the coil and replace it with a fresh one. Then put the tube back on followed by filling, put the tip back on and lay it on it’s side for a few minutes before using. Simple and quick. What Is An Electronic Cigarette Atomizer Coil? 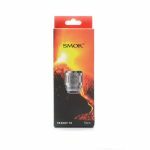 An atomizer coil also known as a replacement coil is the part of an electronic cigarette that heats the eliquid, which ultimately produces the vapour from the electronic cigarette. Once the electronic cigarette battery is activated, it heats up the coil, which then causes the e-liquid to be absorbed into the wick which then produces the vapour when you start vaping. How Long An Atomizer Coil Lasts? There are several factors that determine the lifespan of your atomizer coil. Firstly being the PG/VG in the eliquid itself, but also the duration you vape and the power you run your electronic cigarette battery at. The more power you are running your electronic cigarette battery at, the quicker the coil will burn out. The Higher the wattage and voltage will cause the wire to lose its heating capability, and it will therefore produce less vapour. Additionally those who vape consistently throughout the day, and don’t allow the coil to cool down for a short period of time after their last vape, will need to change their atomizer coils much more frequently than those who vape less frequently throughout the day. How Do You Know Your Coil Is Burning Out? There are several signs indicating that your coil is burning out. The first thing you will experience is reduced vapour production but also maybe a slight difference in taste. Other signs include leaking, maybe a gurgling noises, or poor flavour production. The most common indications of a burning out coil is a rather strange burnt taste. Although this may not be the coil burning out, but could be many other factors that include running the coil at a power that’s not suitable, or insufficient eliquid in the tank itself. The material within the atomizer which is usually cotton or silica wick may visually begin to change colour. When this occurs, the material loses its ability to adequately absorb the eliquid. How Often Should I Replace My Coils? It’s very difficult to gauge how frequently you should change your coil, as there are many factors that can determine the lifespan of the coil, which has been explained above. At FreshMist, we have put together a very general guideline to help evaluate when the correct time is to replace your coil. For a very heavy vaper, and maybe vape throughout the day in fairly constant intervals, you will generally need to replace your coil every 5 – 7 days. For a moderate vaper, where you may only take a couple drags each time, your coils could last up to 14 days. For a very light vaper, who may only vape a few times throughout the day, a coil could last you up to 3 weeks.